Who says you can't find anything at the bottom of a drink? 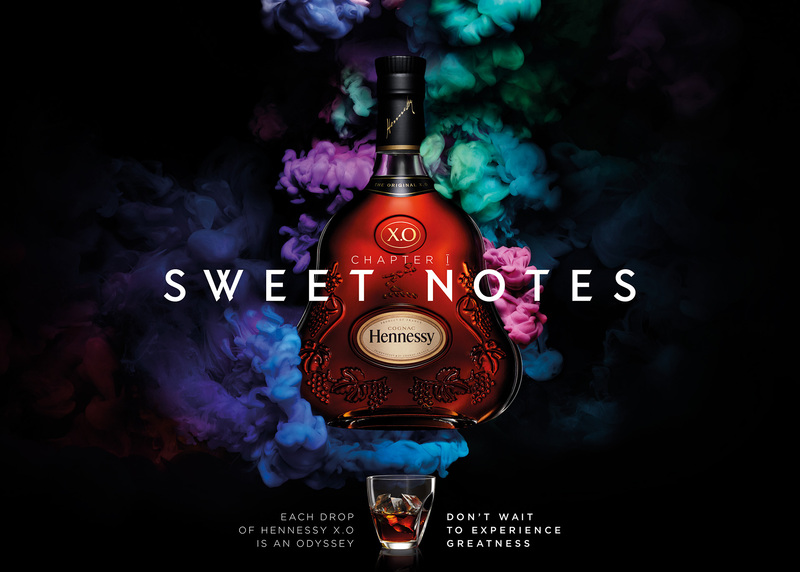 DDB Paris debuts its first-ever work with Hennessy, "Odyssey XO," a journey through the different notes of Hennessy X.O. Cognac, directed by Nicolas Winding Refn, who also made the films Drive and Only God Forgives. The piece kicks off with a hand gliding through water before exploring seven different flavor notes, dubbed "chapters" to give it a sense of narrative. From initial sweet notes to the "infinite echo," a moment's sip is stretched into a smoky, seductive and complete universe (probably the same one that Eyes Wide Shut takes place in). "The film is a journey through taste, based on the impressions and notes of the Hennessy Comité de Dégustation," DDB Paris executive creative director Alexander Kalchev tells AdFreak. "When we read these notes, we realised that they form a sort of a narrative, with each chapter adding another layer of meaning, both symbolically and in terms of taste." The complexity of illustrating flavor in an audiovisual way fueled Kalchev's conviction that Refn was the right guy for the job. Refn, says Kalchev, has an "incredible capability to create images that work on multiple levels, images that you never forget. The result is a dreamscape in which liquid, earth, fire and metal meet, a sensorial experience, rather than just a visual one." "Taste is a powerful sense," adds the director. "Experiencing certain tastes creates the sensation of a journey. The complex flavours in Hennessy X.O. excite the palate and offer rich contour and contrast, opening the door to unique experiences." But who is the ad actually talking to? "We want to raise desire amongst existing brown spirits drinkers while recruiting a new generation of luxury drinkers," global CMO Thomas Moradpour of Hennessy tells us. "This new generation claims a contemporary luxury mind-set; they'd rather collect experiences than possessions. They look for substance beyond status and badges, value the 'now,' and question the traditional archetypes of success." There is something to be said of the ad's "experiential" quality, even if that first hand in the opening scene—clearly in formal dress—suggests the audience it's targeting is no different (and perhaps no younger) than the ones it always has. But Kalchev doesn't see it that way. "Hennessy X.O. was considered a drink for experts, one that you need years of experience and expertise to truly savor. It was 'members only,' " he observes. "We decided to challenge this 'exclusive' mentality by creating an ode to the unique taste of Hennessy X.O. We wanted to intrigue, surprise and provoke, instead of teach and explain, to cut through all the premium spirits advertising, often riddled with clichés of success or dusty heritage stories." This is certainly no dusty heritage tale. The flickering images of people in elaborate headdresses, or covered in gold and chocolate, contrasted with symbolic all-seeing eyes and gritty scenes of motorcycle riders and labor-worked hands over chains, leaves us with more sensations than a coherent sense of story. To magnify this feeling, a VR experience is also available, directed by Stink Digital's Stephan Wever. "The film was shot in Cinecittà studios, home of Fellini, a very special place," Kalchev adds. "Shooting with Nicolas was an incredible experience in itself. He is a sort of a medium, with the images that he creates coming from somewhere deep in his subconscious. It was a unique experience, much like the result itself." It also marks Kalchev's first major production as ecd of DDB Paris, which should give the industry some indication of what to expect from the agency in the future. "Odyssey," he says, is "a bold statement from both DDB and Hennessy to run with something so unique. I'd like to see more brave work like this coming out of the agency." The work launched worldwide last week. Check out the print ads below. Click to enlarge.